Located at the southern tip of the Baja California peninsula in the Mexican state of Baja California Sur, Cabo San Lucas is one of Mexico’s leading tourist destinations. Its unique combination of beautiful beaches, desert terrain, and mountains are a nature lover’s delight. One of its most popular eco-attractions for tourists and sea lions alike is El Arco de Cabo San Lucas (or “Lands End, Cabo San Lucas”), a gorgeous rock formation found at Cabo’s southern tip. 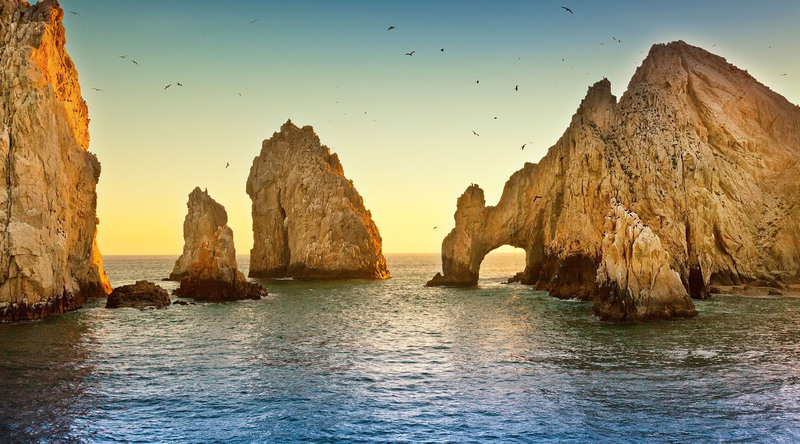 Renowned for its marine life, diving, and surfing, Cabo also features some of the best fishing on the Pacific Coast, while at night, the city turns into one of the world’s great party places—famous for celebrity sightings, fantastic restaurants, and non-stop action at bars like Cabo Wabo and El Squid Roe. This distinctive rock formation is an iconic landmark in the area of Cabo San Lucas. Formed by thousands of years of relentlessly crashing waves, El Arco as its known to locals, is renowned for its surrounding marine life, spectacular snorkeling, and ideal surfing conditions. Cabo San Lucas is famous for its thriving nightlife scene. Celebrity sightings are not uncommon and there are plenty of fantastic restaurants as well as world-famous bars with non-stop action. Whether you’re looking for tequila bars, clubs, or live music, there’s a little something for everyone in Cabo after dark. Admire breathtaking landscapes, miles of unspoiled beaches, and private secluded coves to observe up to six different types of whales as they spout, breach, and swim. Cruise aside the towering rock formations, visit the sea lions colony and idyllic Lover's Beach, one of the few beaches in the world that shares two seas. Enjoy a leisurely stroll through Cabo that leads to a host of local tastings and a traditional Mexican cocktail at famed Cabo Wabo.